Palm's App Catalog getting paid apps on September 24? 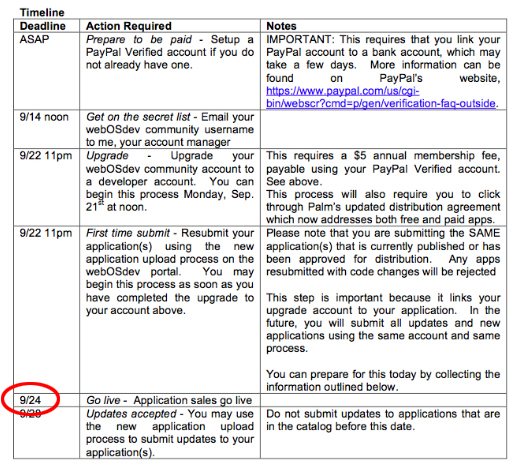 Digital Daily's stumbled across a leaked document apparently addressed to webOS devs that shows a timeline for bringing paid apps to the webOS App Catalog, and one date in particular stands out: September 24 for go-live. The infrastructure's been in beta for a while now, giving everyone some time to get up to speed on the process and iron out the bugs, but for end users, the launch will likely happen in concert with the webOS 1.2 update we've been expecting this month and a redesigned Catalog app designed to support payments. Now, how long before we've got a bazillion-dollar I Am Rich app in there? Palm's App Catalog getting paid apps on September 24? originally appeared on Engadget Mobile on Fri, 18 Sep 2009 13:44:00 EST. Please see our terms for use of feeds.